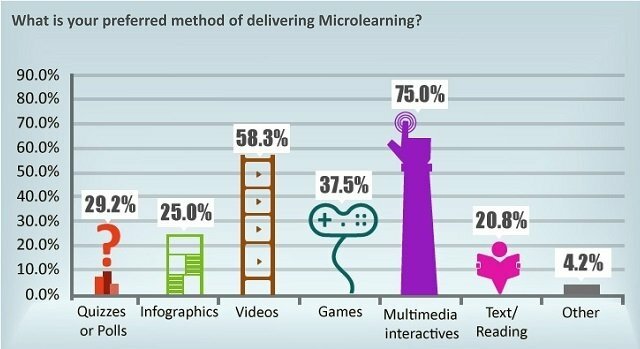 What Does Microlearning Research Tell Us? Respondents of the study in our microlearning research were recruited based on defined interest in learning on LinkedIn and from a list of clients of Harbinger International. Participants were invited to complete the survey online (SurveyMonkey). Microlearning is a way of teaching and delivering content to learners in small, very specific bursts. The learners are typically in control of what and when they’re learning. Three-minute videos could be microlearning. A one-question quiz with reinforcement for wrong answer – that could be microlearning. The Google search conducted to find out whatever happened to that beautiful girl who played Wesley Crusher’s love interest in an episode of Star Trek: The Next Generation could be (informal) microlearning. Microlearning is a bit amorphous in execution, but tends to cohere through philosophy and intent. 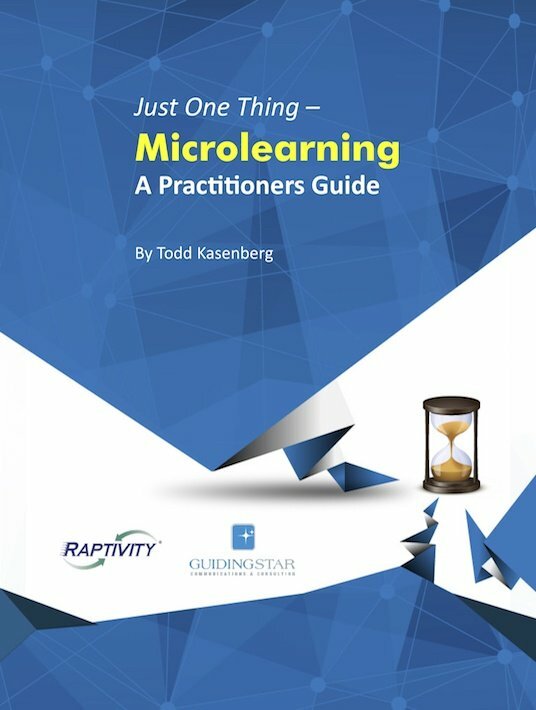 Microlearning has to be completed within a short time. This, of course, brings us back to the simple advice that what is “deliverable” is just one thing. Engagement times for microlearning encounters are measured on the order of minutes, with five minutes pushing the upper limit. That makes microlearning opportunities able to fit into hectic schedules and busy lives without a need to pause, hoping to resume at a later time. It also means that it is almost impossible to complete the traditional delivery of a unit of learning in one microlearning encounter – which often can leave Instructional Designers apoplectic or, alternatively (and more constructively), relying more on their native creativity. Microlearning typically presents somewhat a casual ambiance, allowing learners to feel that they aren’t forced to commit to time/place/tools. It can be sequenced and paced (an approach that takes us not too far from typical chunking of learning content, although we should not mistake that we are just “chunking”, and make sure that all microlearning provides complete…), or it can be on-demand. When on-demand, it could look like a job aide (e.g., providing guidance or reinforcement on a particular step of a process), or it could be pulled from targeted search through a library of prepared microlessons. Microlearning objects may be so simple that they need no navigation, and there is no inherently complex structure. 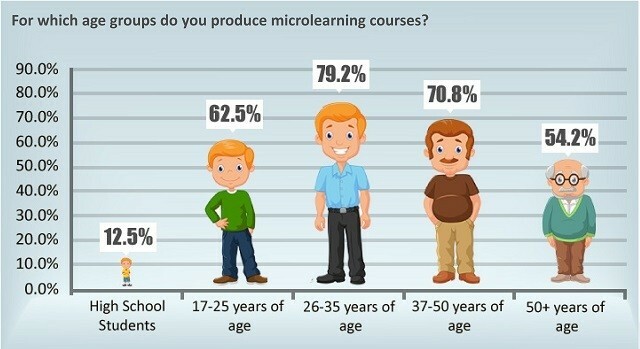 For Whom Is Microlearning Being Developed? 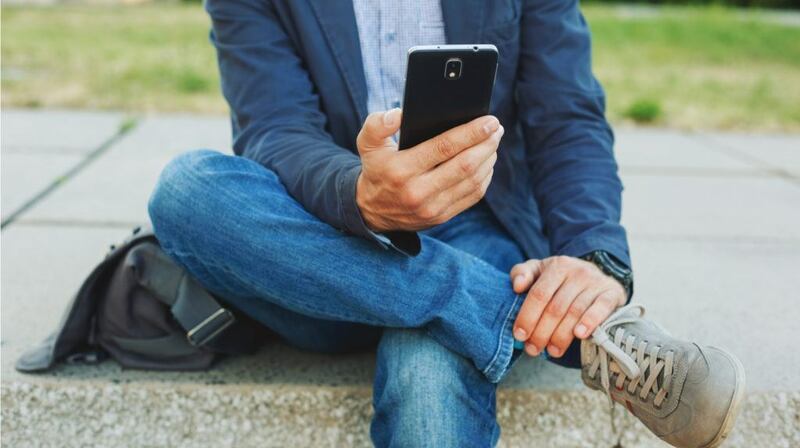 Survey respondents appear to be engaged in producing microlearning for adults – and the audience targeted by their efforts most often is between 26 and 35 years of age. [Figure 4] A majority of respondents did indicate their efforts were targeted at adults, regardless of the apparent age group explored. 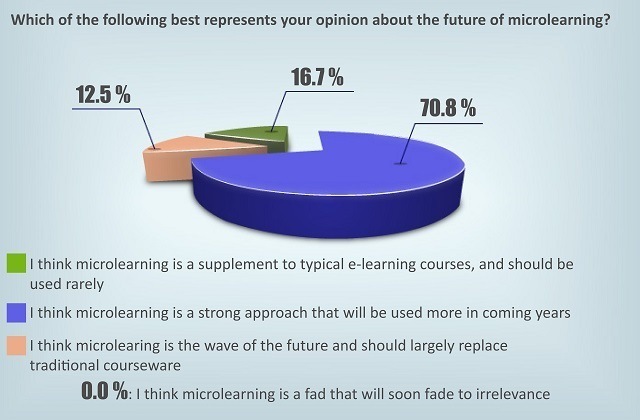 What Approaches And Technologies Are Being Used In Microlearning Development? In a time of MOOCs, communities of practice, and the application of activity theory and flow theory in learning, microlearning can and should take its place with the potential to “participate” in many of these trends and address the implications of much learning theory. One of the larger challenges today is that the eLearning marketplace offers a dizzying number of composing platforms for the variety of approaches currently being used. Despite this, at least at the time of this writing, convincing technology to develop microlearning for smartphones seemingly has yet to emerge from a recent, and expensive, habit of hiring web developers and developing custom code for the phone. 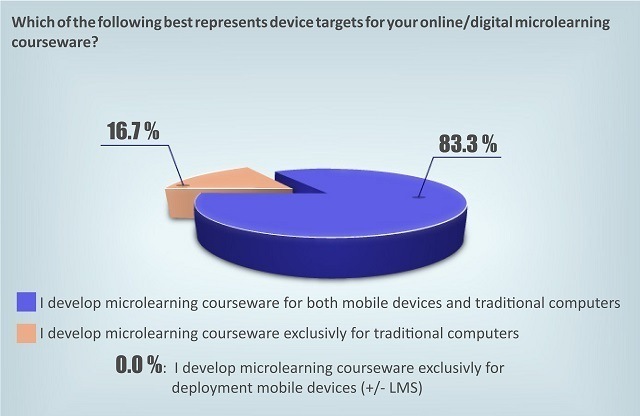 Given Mobile Device Importance, What Technologies Are Being Used To Develop Microlearning? A few respondents reported developing microlearning from custom tool sets or with developers. Response to a question about the biggest challenge did yield, from some respondents, the concern that the currently available tool set for developing microlearning is inadequate. 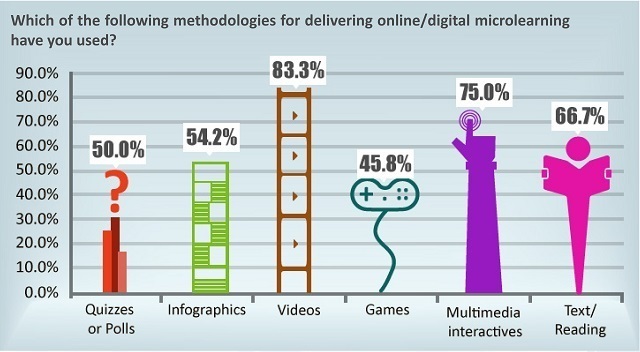 What’s Getting In The Way Of Delivering Microlearning? 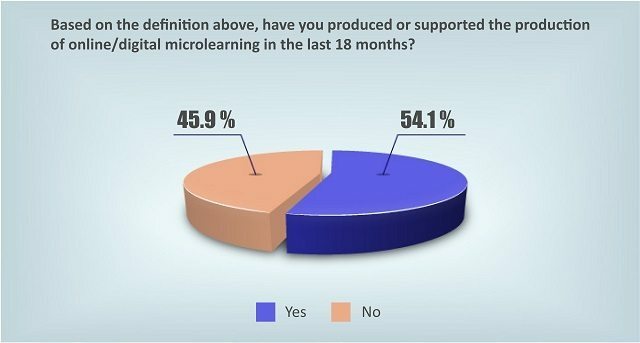 Survey respondents reported a number of reasons for their lack of involvement in the production of microlearning to this point in time; the most common answers were lack of executive support, lack of expertise or skills to produce microlearning, and no or little interest expressed by learners. [Table 2] Respondents answering “Other” indicated a lack of project opportunity, a lack of software to build microlearning, the newness of the approach leading to unfamiliarity, and a sense that the market wasn’t ready for microlearning during the timeframe. Managing the temptation to over-program with too many learning outcomes. A lot of learning being produced is of the compliance training sort – aimed at delivering a mandatory body of information to learners who must take the content over and over again on a regular basis (e.g., health and safety, respect in the workplace). Some Instructional Designers are challenged in the bridging between the traditional “full-out” model for compliance training, especially when certification models relate to “hours” spent in learning, and the short duration of microlearning. Short bursts of learning may leave learners either with an inadequate framework (i.e., some content skipped over) or create gaps in seeing “the full picture”. 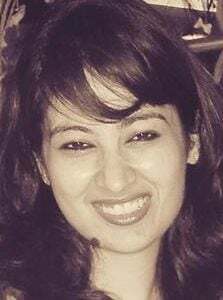 When we are honest – many in the C-suite might find the idea of short, brief blasts of information, as learning objects, hard to swallow because they are stuck with outdated ideas of what learning is. In aggregate – there are some pains ahead for the adoption of microlearning, and only a few decently-conducted parallel trials of more conventional delivery approaches vs microlearning approaches may shed light into what is truly important – behavioral change, knowledge retention, improving systems and structures and motivation to act. Microlearning is part of a movement towards the delivery of just-in-time content and insight, something increasingly being enabled by the internet. Just-in-time is an extremely relevant approach to learning that provides information/coaching/validation at the point of need, exactly when it is needed, and tailored to the individual who needs it. Microlearning is a conscious approach to addressing learning just-in-time; but as we move forward, we are bound to find that it is but a subset of just-in-time learning and that we need to align systems and approaches and design to account for the many faces of this emergent learning movement. It’s going to take a village to raise this child!